"That's always the player I wanted to become, the one the opposition is worried about." Mia Hamm fueled the popularity of women's soccer as both a phenomenal player and one of the founders of the Women's United Soccer Association (WUSA), America's first professional women's soccer league. Hamm was born in 1972, the same year as the enactment of Title IX, the federal law prohibiting gender discrimination in federally funded education that opened sports opportunities to girls and women. Hamm distinguished herself at age 15 as the youngest member of the U.S. National Soccer Team. The team won World Cup Championships in 1991 and 1999, and captured gold medals at the 1996 Atlanta Olympics and the 1998 Goodwill Games. 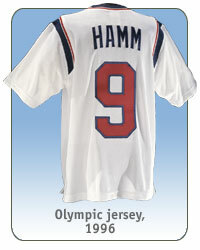 A highlight of Hamm's amateur career was a silver medal at the Sydney Olympics in 2000. As a professional, Hamm helped establish the WUSA. Her popularity and skill with the WUSA's Washington (DC) Freedom inspired thousands of young girls to take up competitive sports, especially soccer. The Everything Kids' Soccer Book: Rules, Techniques, and More about Your Favorite Sport! "Women of the Games: Going for the Gold on E!"